The FreeSBC is just one component of TelcoBridges’ portfolio of carrier-grade solutions. Product-of-the-Year recipients are verifiable leaders in the marketplace, and their innovative products within the cloud computing space stand out from competitive offerings. TelcoBridges, the leading designer and manufacturer of carrier-grade Tmedia VoIP gateways and the FreeSBC, today announced that TMC’s Cloud Computing Magazine has awarded a 2018 Cloud Computing Product-of-the-Year Award to TelcoBridges’ FreeSBC virtual session border controller. These prestigious awards honor vendors with the most innovative, useful and beneficial cloud-based products that have been available to deploy within the past year. TelcoBridges’ FreeSBC virtual session border controller protects networks from DoS and DDoS attacks while offering outstanding session handling performance. The FreeSBC runs on any combination of VMware, OpenStack, Amazon/AWS and bare metal servers as well as dedicated network devices as part of virtual network function integration. The FreeSBC is offered via a “freemium” business model. Sessions can be licensed at no cost or with optional support, and premium feature subscriptions for $1/session/year. To date, more than 3 million sessions have been downloaded by hundreds of customers in 59 countries around the globe. The award-winning FreeSBC scales up and down - supporting anywhere from 100 to 60,000 sessions per instance, with support for 1,100 completed sessions per second (CSPS) and up to 6,000 session attempts per second (SAPS). 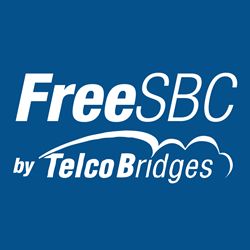 The FreeSBC is just one component of TelcoBridges’ portfolio of carrier-grade solutions. A wide array of optional paid services and extensions are available, including 24/7 support, analytics for troubleshooting, fraud detection, call removal and more. Support for transcoding is made possible via optional IP-based DSP hardware resources, which are sold in various capacities. To learn more about the FreeSBC offering visit freesbc.com. TelcoBridges is a leader in the design and manufacture of carrier grade, high performance, and high-density SBCs and VoIP gateways. Based in Montreal with offices in Poland, Turkey and Hong Kong, TelcoBridges has deployed VoIP solutions in more than 100 countries worldwide. TelcoBridges' brands include: FreeSBC™, Tmedia™ (VoIP media gateways), Tsig™ (signaling gateways), Tdev™ (development platforms) and Tmonitor™ (real-time network monitoring equipment). For more information, visit freesbc.com or http://www.telcobridges.com.